A total of 1,499 students are enrolled in Wilson College for the fall semester, the most in the college’s 149-year history. Total enrollment is up more than 23 percent over last year and the number of new students entering the traditional undergraduate college increased by nearly 16 percent over fall 2017, producing the largest incoming class since 1966. Wilson has its largest enrollment in the traditional undergraduate program since 1968. This year, 662 students are enrolled in the undergraduate college, a 19.7 percent increase from last fall. Nearly 60 percent of these students live on campus. Men now represent 19 percent of this population and nearly 21 percent of the total enrollment. This year’s enrollment marks the sixth consecutive year of growth under the Wilson Today plan, a series of measures approved in 2013 to revitalize the college and set it on a path to economic health and sustainability. The plan included a tuition reduction and student loan buyback program, new career-oriented academic programs, campus improvements, coeducation in all programs and improved marketing and retention efforts. Wilson’s second-largest student population is in graduate programs, with 455 students enrolled this year in 10 master’s degree programs—a 16.6 percent increase over fall 2017. 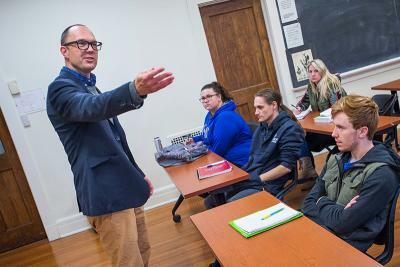 A total of 382 students are enrolled in the college’s adult degree program and other programs such a dual enrollment, up nearly 40 percent since last year. Wilson students come from as far away as California and Florida. They represent 24 states (including Pennsylvania), as well as 17 foreign countries. Wilson’s continued enrollment increase contrasts with national enrollment trends. Based on the most recent data available, the National Student Clearinghouse Research Center reported a decline of 1 percent in higher education enrollment nationally for 2017, while showing a 0.4 percent decrease at four-year, nonprofit private colleges. Since 2013, Wilson has seen a 115 percent increase in traditional undergraduate enrollment, with a 126 percent increase overall. Wilson College, which held or reduced tuition for a total of eight years through the 2018-19 academic year, was recently recognized in U.S. News & World Report’s 2019 “Best Colleges” guide, which ranks the college ninth in the “best value” category for regional colleges in the North. The value designation is an indication that the college provides a high-quality education at a reasonable price. Wilson College is committed to providing students with an affordable education that offers real value and successful outcomes. The college held tuition steady for three consecutive years before reducing it by $5,000, or 17 percent, to $23,745 for the 2014-15 academic year, followed by four more years without an increase for traditional undergraduates. Wilson has announced plans for a 3 percent tuition increase in 2019-20.